On the grounds that speed cameras have not reduced the number of accidents in the United Kingdom, the Government has decided to reduce its road safety grants to local authorities this year from GBP 77 million to GBP 56 million. As a result, speed cameras across England are being scrapped one after the other. No new speed cameras will be installed in the foreseeable future either, as the new coalition Government has withdrawn funding for them in a view to cutting costs. Last weekend, 79 speed cameras were removed from the English roads, including Oxfordshire, which could well be followed soon by Cornwall and Devon. Local authorities are struggling to keep speed cameras going which, due to the lack of Government grant and funding, are now becoming very expensive to run, hence their scrapping. This is obviously good news for English motorists and motorcyclists who may avoid millions of pounds of fines going forward for driving/riding over the speed limit. That said, whilst local authorities have been removing fixed speed cameras in their respective areas, portable cameras are still operating, which means that motorists and motorcyclists can still get caught by Police officers while driving dangerously, but obviously, the risk of this is now reduced. Funny enough, local authorities that have so far taken steps to remove fixed speed cameras have left their covering box intact, presumably in an attempt to mislead road users and make them believe that such cameras are still in operation. Meanwhile on the other side of the English Channel, the situation is totally different. The French Government has decided to reinforce the presence of speed cameras across France. 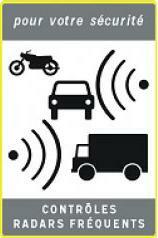 Starting next week, 3rd August 2010, France will see new radar warning signs appear on the roads. Until now, the signs (see left photo) warned you of a radar up ahead, usually within 500 meters. 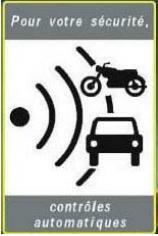 The sign was followed by the speed limit, so you could slow down and drive your car or ride your motorcycle through the camera at the authorised speed. But starting next week, that’s changing. A new sign (see the right photo) will tell you that you are in a zone that contains a speed radar, but the zone itself could be up to 2 kilometers long, meaning you’ll need to slow down for two kilometers. The new signs will be rolled out all over the country gradually, region by region. So if you’re a English, visiting France on holiday and used not to bother too much about speed cameras on the grounds that they’re disappearing in England, then be careful because you might well get caught across the Channel and have to pay a nasty fine on the spot. 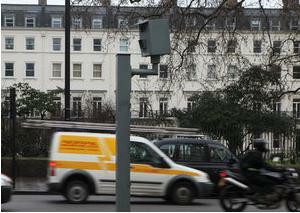 Is it the end of road for the speed camera?